Veterans ride across Canada to raise awareness for issues affecting them. Aug. 20, 2015 2:00 p.m. Early in the morning on Saturday, Aug. 22, Port Alberni’s Monty Elliston will be back in the saddle alongside his brother Ray, and taking a very special horse ride. The Ellistons will be participating in the Ride Across Canada, supporting Canadian veterans. The ride is 211-day horseback ride across the country that founder Paul Nichols developed to help bring awareness to contemporary veterans and their stories. Elliston, who is president of Royal Canadian Legion Br. 293 in Port Alberni, spent 32 years in the Armed Forces. He started as an apprentice with the Royal Canadian Electrical and Mechanical Engineers in 1956 as an electrician. With integration in 1968, anyone serving on aircraft were considered airforce members, so Elliston moved to the air side. He retired from the airforce in 1986. Elliston’s brother Raymond, who lives in Almonte, ON, is three years younger and served 38 years with the Royal Canadian Regiment, retiring as a lieutenant colonel with the infantry. The brothers were the second generation of men serving in the military: their father served in the Second World War then, when the war was over, joined the militia. Elliston’s son started in cadets and served with the reserves and the regular force before retiring a couple of years ago. 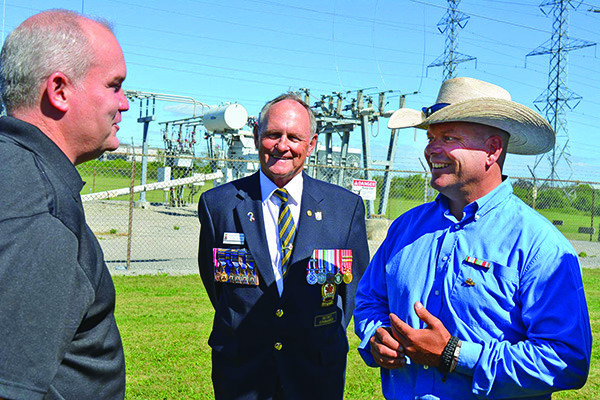 Ride Across Canada founder Paul Nichols speaks with Veterans Affairs Minister Erin O’Toole near Ajax, ON on Aug. 12 as Robert Buchanan, Royal Canadian Legion Ontario Command District “F” Commander, looks on. There are more than 540,000 veterans in Canada with an average age of 56. The Ride Across Canada will feature the faces and stories of more than 700 veterans from Victoria to St. John’s, Newfoundland. “In order to understand our veterans and their needs, it is imperative that we hear their stories and get a clear vision of who our veterans are,” the organizers of the Ride Across Canada state on their website. Every veteran of the Armed Forces has a story and Elliston is no different. “I don’t have any horror stories,” he said. “I was never shot at. When Elliston first heard about the ride he got behind the effort. “Then my brother said it was something he and I could do together. “It’s also showing support for veterans today,” Elliston said. Raymond rides regularly in Almonte, boarding his own horse in a nearby farm. He has been involved with the ride in another capacity, setting up base camps in Kingston and Smith Falls, near Ottawa. It has been a few years since Elliston has ridden a horse, he admits, but he is up to the challenge. He and Raymond will depart Kingston, ON on Saturday, Aug. 22 and ride the leg to Ottawa, arriving in the nation’s capital on Aug. 29. Elliston will be an “official” rider for one of the days of their leg; for the others he and Raymond will switch riding Raymond’s horse and driving the truck and horse trailer. Once the ride is finished, the veterans’ stories will be published in a book. To follow the ride or to make a donation, please go online to www.communitiesfor veterans.com. Elliston is accepting donations at the Legion in Port Alberni, and Branch 293 will match donations up to $200. There is also a Facebook page to follow the event at Communities for Veterans, the Ride Across Canada.